We have over the last few years sold a number of the excellent Valiant ribs complete with Mercury outboards to water sports centres & sailing clubs, so we were delighted when EP Barrus the new importers of Valiant asked us if we would like to be the Northern dealers for the range. This Valiant destined for Kielder Water’s Hawkhurst Activity Centre arrived yesterday just in time to be greeted by the torrential rain that devastated the Newcastle area! Two hours later 18 inches of rain was sitting in the packaged rib. The challenge this morning was how to remove the rain water. Should we use a Whale manual bilge pump, connect a 12volt battery to a Rule pump, charge up an Aquacharge portable pump or use the rather nifty Superpump advertised as the ’best & most effective instrument to transfer liquids without energy’? With a few flicks of his wrist our versatile Andy set it away, the end result no effort and a dry rib ready to be fitted out with console, Snipe trailer & of course a new outboard! 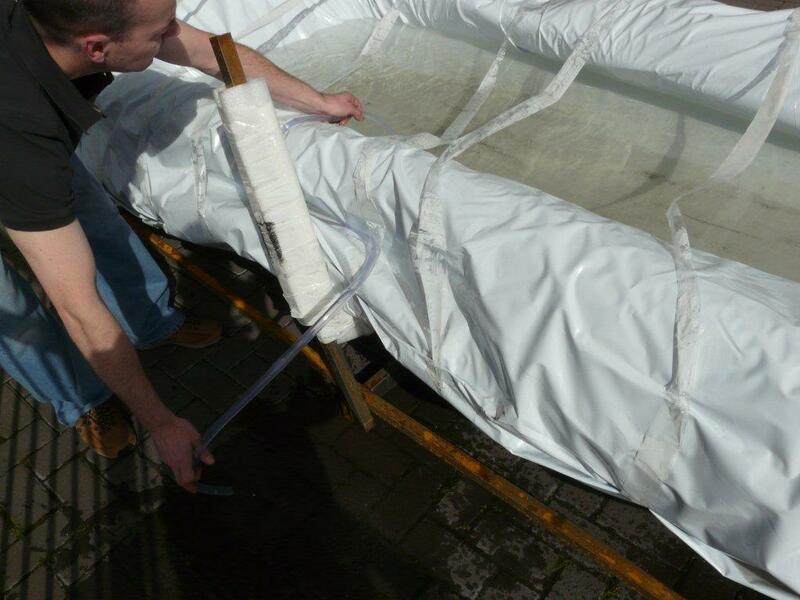 This entry was posted in General Interest, New Products and tagged Aquacharge, Jabsco, Mercury, Rule, Snipe Trailers, Superpump, Valiant, Whale on June 29, 2012 by Iain Forrest. Well it never rains but it pours, certainly yesterday afternoon proved that one! There we were busying ourselves in the chandlery when the sky outside went dark & cars were passing with lights on. Tremendous flash outside, followed immediately by the thunder (wonder if that was the bolt of lightning that struck the iconic Tyne bridge) then the rains came. Last time we had rain like that the workshop flooded & loads of clothing stock was ruined, fortunately our flood defences held & with the sterling help of our staff using Shurhold deck brushes no water entered the building, sadly the hairdresser, dog grooming parlour & other businesses on our corner were not so fortunate. 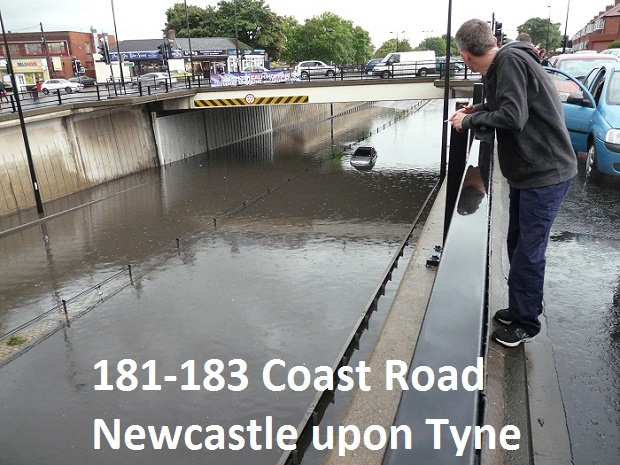 As can be seen from the images the A 1058 which is the main road outside our premises was flooded, director Andy Burgess walked home (pinched a pr of Sealskinz socks from the stock) so his feet were dry & grabbed at the same time a Musto Sou'wester to keep what's left of his hair dry! He did think of taking a Spinlock lifejacket from stock just in case but thought better off it. The other Andy (he who runs our internet site) chose to drive home & what should have been seven minutes mins 'down the road' ended up as four hours! He is off on holiday to Amsterdam tomorrow so had fortunately taken the pilot guide of the 'Inland Waterways of the Netherlands'. Excellent reading when you are stuck in a car! This entry was posted in General Interest and tagged Musto, Pilot Book, Sealskins, Shurhold, Spinlock on June 29, 2012 by Iain Forrest. Many years ago when I was even dafter and more foolish, I spent a couple of Novembers coaching the Indian national sailing team out in India, had a great time & yes the team enjoyed success at the Asian games that followed! We were paid in rupees which was problematic because at the time you could not change more rupees to sterling than you had converted when going out! To overcome this slight 'currency issue' I purchased in Bombay (now known as Mumbai) loads of silk, which my good lady made into dresses for my young daughters & herself. For me, I purchased from the stalls next to the ship breakers a load of nautical artefacts inc a navigation light. This light has slowly over the years got duller mainly because it was such hard work to polish, however& it was only last week that Jenny tried a metal polish from Davey & Co, her verdict easy to apply & very very easy to rub off & get a great result; the picture tells a thousand words. Incidentally the floor that the light is being displayed on, was painted black when we first moved in, we stripped it, sanded it, then applied eight coats of Epifanes gloss varnish (first coat thinned 50%) & then finished with two coats of Epifanes rubbed effect varnish, if it lasts the same number of years that the dining room floor did in our last house, 20 odd years I will be well pleased. This entry was posted in New Products and tagged Davey & Co, Daveyshine, Epifanes on June 27, 2012 by Iain Forrest. Was working in the sailloft today on a replacement fly bridge cover (using the customers old one as a pattern) when out scuttled this rather large spider; there was a little scream from my favourite machinist & the ‘downing of the tools’ till the offending furry friend was shown the way via the fire escape. Got me thinking, have we got stocks of Starbrite’s Spider Away, which when I checked we did have & after the torrential rain this weekend plenty of Starbrite Waterproofing. What with the rain & the thunder & lightning yesterday I also wondered if we would get calls asking for the Lightning Master static dissipaters, always popular with the guys we supply on their round the world cruises. This entry was posted in New Products and tagged Forespar, Lightning, Spider, Starbrite on June 26, 2012 by Iain Forrest. 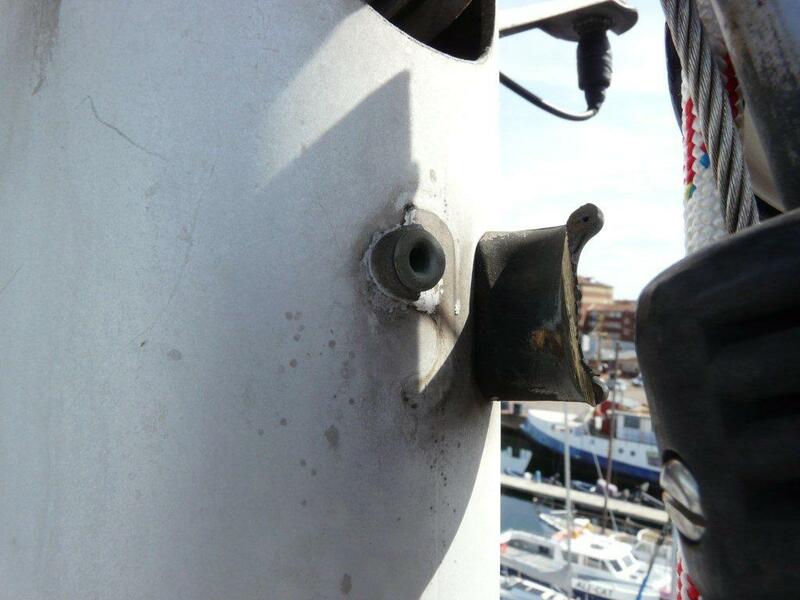 It looked okay-ish when he put the mast up two months ago, and he did purchase a replacement Plastimo halyard diverter 'just in case' Well the call came thru late Tuesday, 'Can you please climb my mast, remove & replace the halyard diverter. The wire halyard has 'sawn thru it' & can you do before the Wednesday night race?' No problem, we will get our rigger & his assistant down today. When climbing we always use a halyard in good condition backed up with a safety line topping lift , we trust our knots & not a shackle or snap, we knew the halyard was in good condition cos we had supplied a 12mm Dyneema spinnaker halyard three months ago. To get our rigger up the mast a Harken lock in double grip locking winch handle is our choice of weapon. This entry was posted in General Interest, Tips and Advice and tagged Dyneema, Harken on June 25, 2012 by Iain Forrest. As I mentioned in my last blog, when we got ashore after our Wednesday night race there was a collection of fire engines, ambulance & a police van blocking the road from the crane to the boatyard. It transpired that a yacht owner decided to have a brew earlier on, gas ring was lit & what happened next was a flash & bang & the port lights blew out, a shaken skipper with thankfully only superficial burns! Needless to say the sales of gas alarms from the portable Omnitron at £44-95 to our best selling NASA gas alarm & also the Pilot range of alarms have gone thru the roof, fire extinguishers from the Fireblitz range are selling like hot cakes, if you will pardon my pun(s). Incidentally last year there was a gas explosion onboard an elderly wooden boat at a marina further up the coast, the ‘lucky skipper’ survived the deck being blown off (timbers landing 50mtrs away) & ended up in the water! Needless to say this classic motorboat was a write off. This entry was posted in Safety and tagged Fireblitz, NASA Marine Gas Detector, Omnitron Gas detector, Pilot Gas Alarm on June 24, 2012 by Iain Forrest. Had a feeling that this one would be the one where we got the breakthrough & took home the chocolates, alas it was not to be! Sadly the nut on the tiller (me) let the team on Clapped Out Toy Boy down, even though we had three Optimum Time pieces amongst the four of us on board our start was diabolical, in the light winds, we were stuffed on the start line! Never mind after the terrible start (2nd last over the line) & a sort of average first beat we managed to pull thru' the fleet, due methinks to the kite handling of an ex Int 14 sailor who had come along for the ride. There was fun & games however at the last mark, due we think to the pressure we were putting on the leading boats with a coming together of the two other Melges, no penalty taken & a protest still to be heard, you never know we may end up second, I did have to lend the protester my Elvestrom rules book, hope he comes in to buy his own! For once the sun was out so was glad to be wearing my Musto Sunnies! The ‘excitement’ of the evening was, however, still to come. After craning her out we discovered the road to the boatyard blocked with two fire engines, police van & an ambulance & a rumour circulating that there had been a gas explosion! 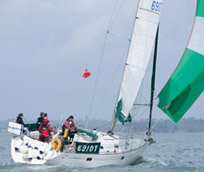 This entry was posted in Race News and tagged Elvestrom, Musto, Optimum time on June 24, 2012 by Iain Forrest. This entry was posted in General Interest and tagged Lewmar, Raymarine, SP Epoxy, West System on June 21, 2012 by Iain Forrest. Over the last thirty odd years we have had our moments with carriers, strangely its usually goods being delivered (or lack of delivery should I say) that’s the issue, however our friends in Kenya were a happy bunch this past Monday. Kilifi boatyard were delighted that the pallet load of stainless steel cap shrouds, lowers etc in 10,12 & 14 mm was collected from our Newcastle premises late last Wednesday afternoon & was in Nairobi airport am Monday the 18th, also in the consignment was a load of StaLok & Petersen’s rigging components, Blakes seacocks, Whale pumps & some Harken spares. 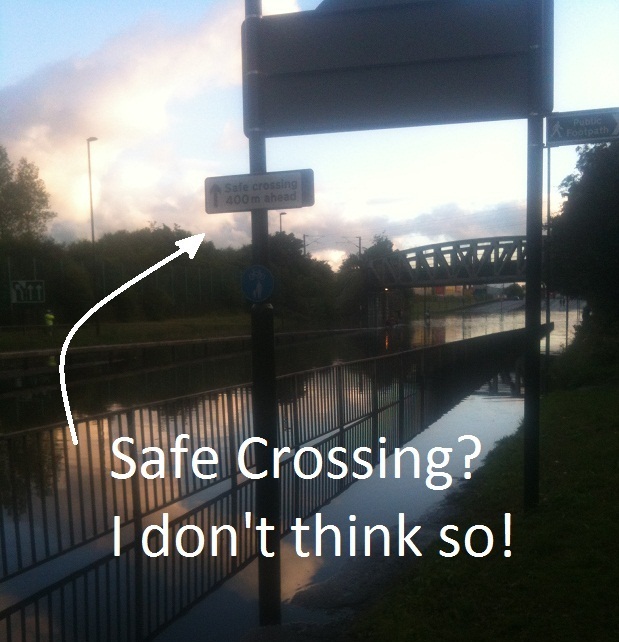 Thanks guys, it was vital that the pallet got there quickly, apparently tides were the issue as if there was a delay with the height of the mast it would not get under the bridge in the foreseeable future! p.s. We were somewhat surprised that the parcel we took to the post office at 5pm yesterday has already arrived in Malta this morning. Well done Royal Mail Airsure. I just love it when a plan comes together. This entry was posted in General Interest and tagged Blakes, Harken, Whale on June 21, 2012 by Iain Forrest. For anyone looking to learn how to sail an RYA Competent Crew course would be a good place to start. 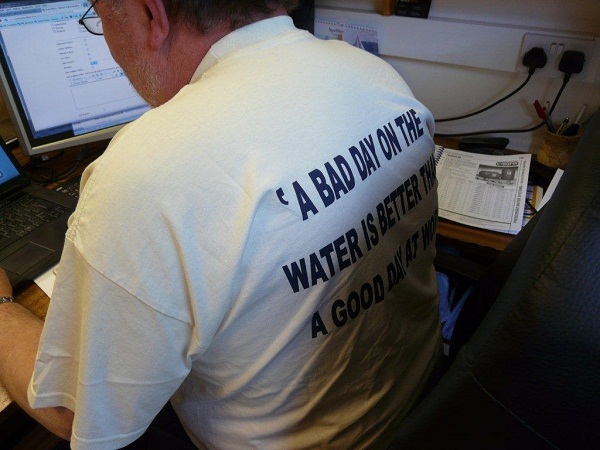 The course syllabus is set by the RYA (Royal Yachting Association) but run by sailing schools. The Competent Crew course forms part of a whole series of RYA courses that take you from total beginner to ocean sailor – if that is what you want. Each course is a standalone course and a lot of fun. You do not have to have plans to sail around the world to start doing the courses. 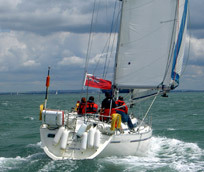 The Competent Crew course is the first course in this RYA ‘Cruising Scheme’. It assumes you have no or very little previous sailing experience. At the end of the course you will be a useful crew member. Indeed - a competent crew member, capable of helping out on board in most tasks. You will learn how to set the sails correctly to the wind and how to raise and lower them. You will learn all the nautical jargon and names for different parts of the boat. You will also learn what to do with ropes and fenders when the boat moors up in a marina. The Competent Crew course is 5 days long. 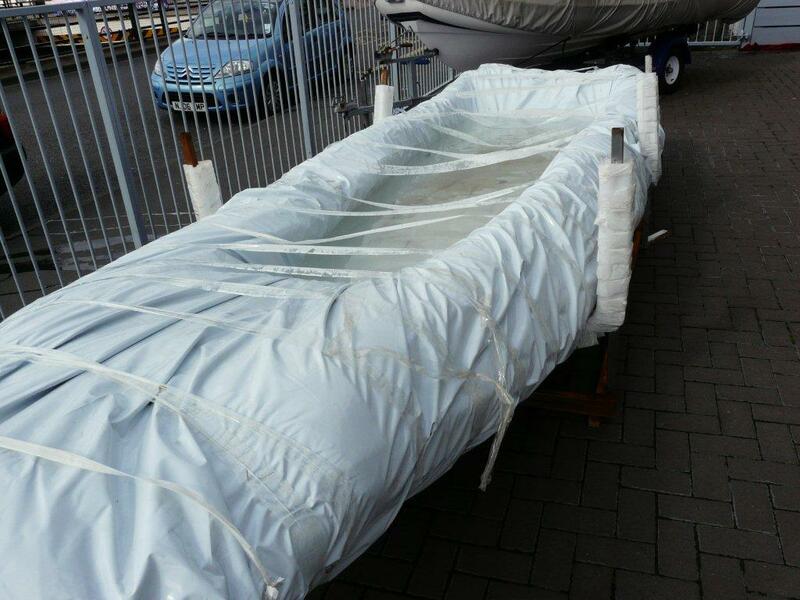 Part of the course is learning about life on board a yacht and with this in mind accommodation is on the yacht. Most sailing schools arrange the cabins so that it is very rare that someone would end up sharing a cabin with a complete stranger. All food is eaten on board. Breakfasts are usually quite hearty, lunches consist of soups, sandwiches and salads which can be eaten whilst sailing along and supper is usually cooked alongside in a marina or at a quiet secluded anchorage. Sometimes everyone chooses to go to a pub or restaurant for supper. Thousands of people have started sailing by doing a Competent Crew course. It sets people up with good habits and allows them to go on with a full appreciation of what sailing is about – lots and lots of fun! If you would like to know more about Competent Crew courses First Class Sailing are more than happy to answer any questions. This entry was posted in General Interest and tagged First Class Sailing on June 21, 2012 by Iain Forrest.